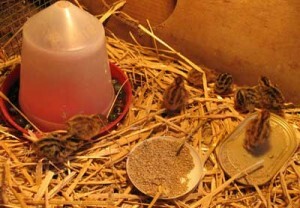 I moved the day old quail chicks from the incubator after they had been hatched for 24 hours. 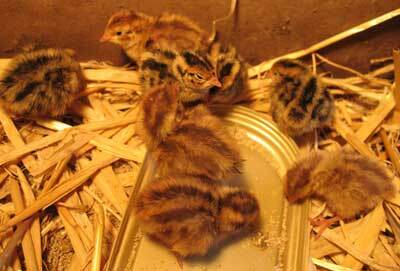 Quail chicks can survive without food and water in the incubator for at least 24 hours as they absorb the yolk sac just before they hatch which provides them with nutirents in the first 24 hours. I put the quail chicks into a small box to move them to the brooder. 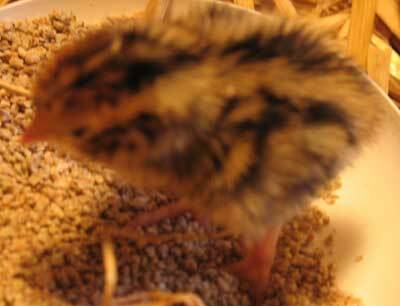 The quail chicks are very tiny when they first hatch. They had time to dry off and fluff up in the incubator and once they had been hatched for 24 hours they were very lively indeed. It was difficult to pick them up as they kept trying to jump out of the incubator and my hand! The brooder is an outdoor rabbit/guinea pig run and I have placed in on top of an old carpet outside and then put straw in it which will stop the chicks from getting a draught and from getting splayed legs. They have some chick crumbs to eat and a drinker with warm water in it and marbles around the edge to stop the chicks from drowning in the water. There is a heat lamp set up so that the chicks are kept warm enough. Thanks for your enquiry. I don’t have any day old chicks at the moment. 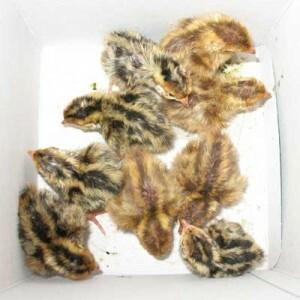 If you are looking for quail chicks then please feel free to write your enquiry on the farmingfriends forum here http://farmingfriends.com/forums/forum.php?id=19 with how many you are looking for and where you are located so that quail breeders can respond if they are in your area. would be able to post them to you.